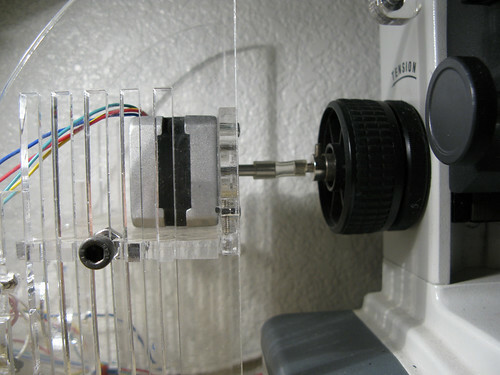 The Z-Axis control holds a stepper motor in place to turn the fine focus knob on the microscope. 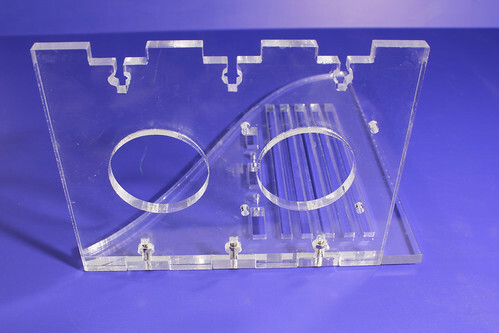 This requires a framework to hold the stepper in place, a stepper motor and electronics to drive it, and the big issue: a way to connect to the focusing knob. 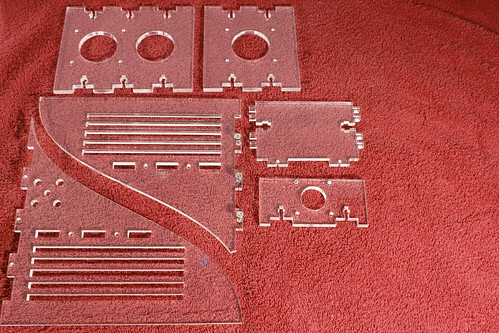 All of the laser cut acrylic parts. 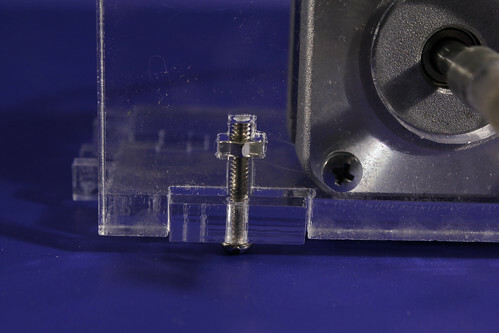 Detail showing the nut and screw into acrylic assembly. Screw the stepper motor to the motor mount sled. 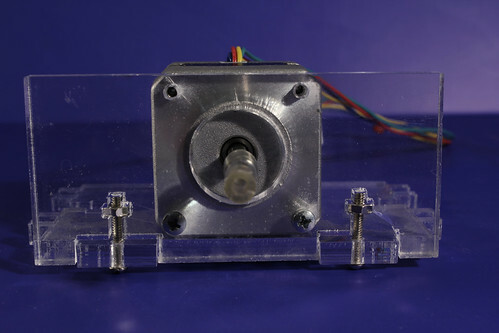 Rear view of stepper motor mounted into motor sled. Note the chipping of the acrylic on the left side. This was caused by over tightening the screw, but does not seem to affect how the rig works. Take one of the sides and put three of the small screws in the bottom holes. Put the nuts on loosely so the side is loose enough to fit onto the side. Fit the Bottom piece into the slots, tighten the screws a bit past finger tight. But don't over tighten anything on the rig. The original acrylic version is brittle and the acrylic will crack if it is overtightened. 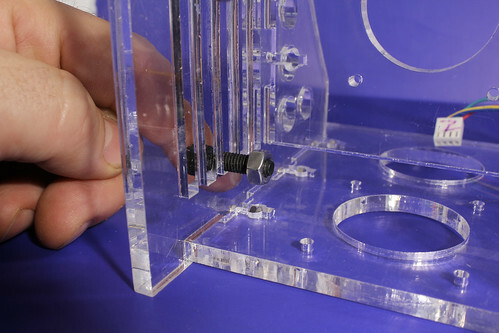 Attach the center vertical support to the side and bottom using the same screws. It can help to hold the nut with a pair of pliers, to get it to fit into and stay in the slot while you thread the screw in. 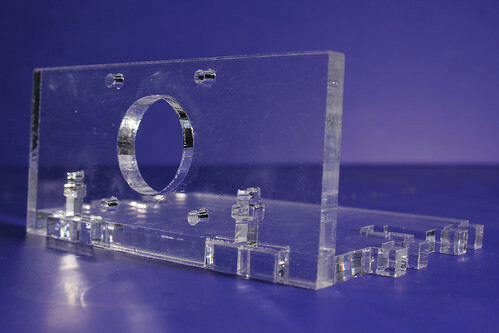 One side, center, and bottom assembled and tightened (loosely, don't crack the acrylic!) together. Insert the motor sled into the completed side. The tabs on the motor sled fit into the slots on the side. 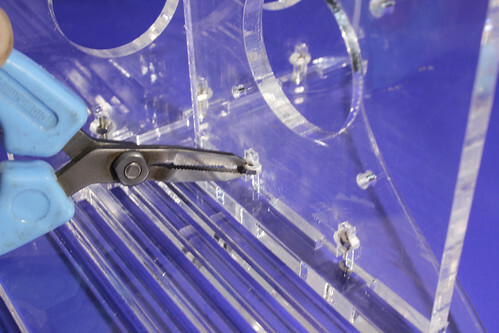 Put the smaller screws and nuts on the second side, slip it into place. This might take a little bit of fiddling to get everything to fit together. Then screw in the larger screw to line up with the large slot on the motor sled. The large nut and bolt to hold one side of the motor slide in place. Insert one on each side piece. Slip the larger nut into the large slot on the motor slide. Tighten enough so the screw doesn't fall out, but still allows the motor to slide up and down. Repeat for other side. The frame is now assembled! 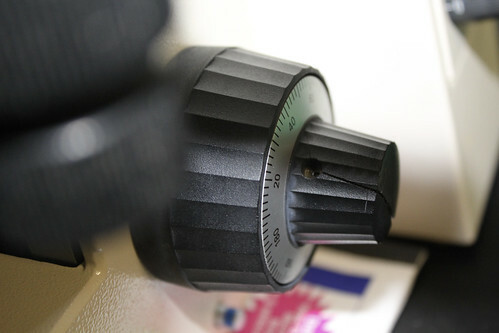 This is a gratuitous shot of basically surplus microscopes. This is to emphasize the number of instruments which are not being used, and which darn it, should be automated and used around the clock! 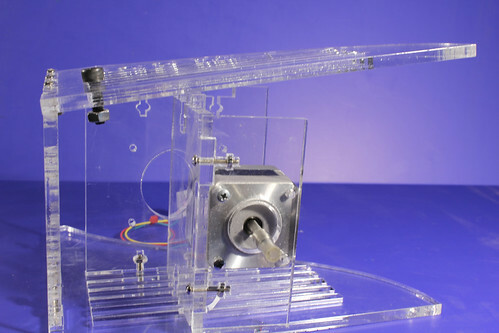 We have come up with mutliple real and pie in the sky methods for attaching the stepper motor to the knob. 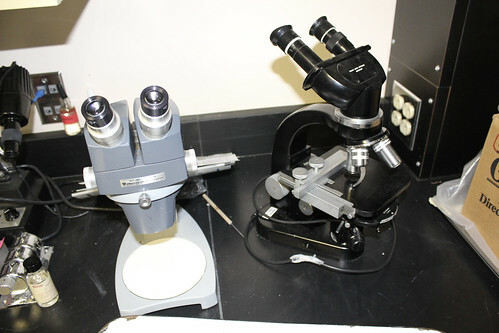 Our current rig involved removing the fine focus knob from one side of the microscope. We then had to fabricate a snaper and a fitting held in place with a set screw which holds pressure against a spring clip which pushes against the gross focus knob. Not that the stepper motor is coupled to the microscope fine focus axel with a bit of tubing. This turns out to be a wonderful material! It acts a little like a clutch, and it takes up and gives back some of the stress of starting and stopping to turn the knob. It also makes up for slight misalignments. So rather than put stress on the bearings in the motor or in the stepper assembly it protects both. 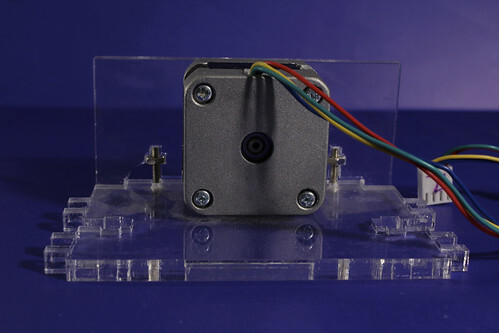 This is how we coupled the stepper motors for the nano gigapan project last summer. 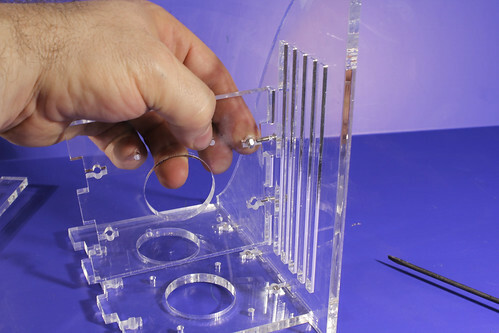 This is an example of assembling a device out of laser cut materials, which in this case are glued together, to create a three dimensional part. I use a bit of 1/8" acryllic rod as the axle surface here. But I think that a 8-32 or so bolt would be stronger. 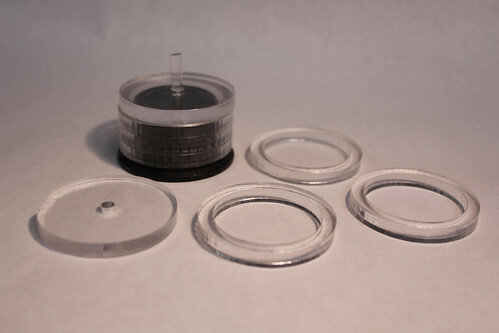 The plastic knobs could also be made of rings of different diameters, which I think would be able to couple to knobs like this Zeiss Scope, where there is a substantial taper in the knob! 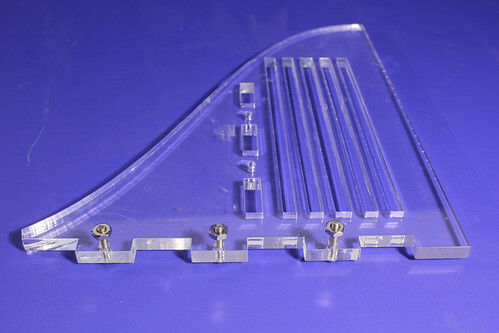 We have also experimented with Shape Lock plastic. This is a 'low temperature thermoplastic.' In real terms, you put a bit into a class bowl with a bit of water in it in the microwave. Heat it a bit - to about 150 f. And then fish the material out start shaping it. 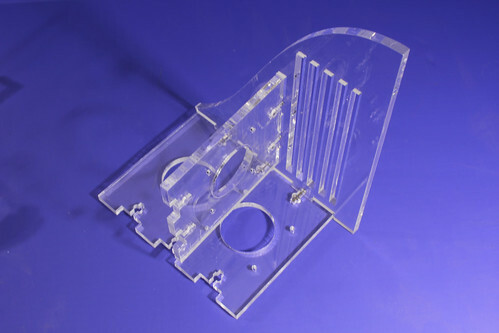 We made some 'spaghetti strip' bits of shapelock which we wrapped around the knob, and then squisshed tinto place but putting the knob ove the shape lock plastic. This is a highly effective technique for matching different size materials! 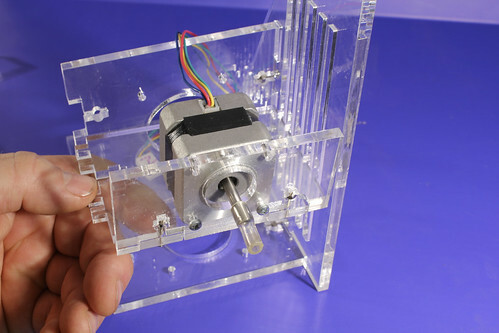 We have come up with multiple ways to couple a stepper motor to the fine focusing know on a microscope. They require different amounts of fiddling, and different amounts of potential risk to the 'pristine' nature of the instrument.